I’ve rambled a lot over the years regarding my gratitude for everything I have, as well as everything I’ve experienced over the years, good and bad. Each incident we pass through affects us for the rest of our lives. They help to shape us and we add those moments to our memory banks, to cherish and to reflect upon. Thanksgiving is a truly wonderful holiday. Kudos to Mr. Lincoln for recognizing that we have an incredible bounty for which our souls need to appreciate. I’m not talking material possessions. I mean sunrises like the one this morning, the fresh smell of the rain, the giggling of the neighbor girls in the street. With the way people embrace Christmas, I fear that the power of Thanksgiving is gradually being diminished and it’s becoming the holiday that just gets in the way of the Big C. That was evident when stores started opening up on Thanksgiving Day to fuel the frenzy even more. When I was a kid, that would have been unthinkable. For that matter, when I was growing up, stores (including the mall) were closed on Sundays. Can you imagine? If I allow myself to be visited by the Ghost of Thanksgivings Past, I would be treated to a return visit of some pretty good times in my life.As a kid, I’d see me sneaking the green olives with the pimentos from the nicely decorated table. I’d smell that green bean casserole with the Funyons on top. During the years we went over to my aunt & uncle’s house, where my paternal grandmother also lived, there were garage dances after dinner, with a record player spinning polkas or whatever music they enjoyed dancing to in those days. In my early 20s, I was playing radio in Yakima and we did a promotion called, “KQOT Gives You The Bird.” We gave away turkeys by going to a phone booth and making a call to the station. The first person to arrive there won the turkey. There was our WKRP moment when two people arrived at the same time and it made for great radio. There was also the time that one of the sales guys called in, there was accident involving two people trying to be the first and the person phoning in quickly departed the scene, for liability’s sake. In my late 20s, the Ghost would show me the year of the big Thanksgiving Day windstorm where we lost power and I was forced to barbecue our turkey for Thanksgiving dinner that year. I’ve been preparing my turkeys that way ever since. 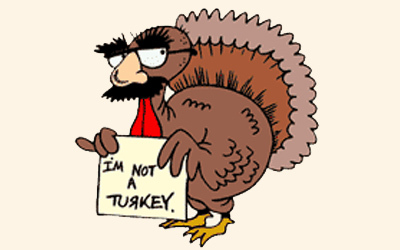 Several years later, during the Murdock, Hunter & Alice days on KLSY, we interviewed Chef Paul Prudhomme several days before Turkey Day and asked how he was preparing his turkey. He told us he was brining it for 24 hours before baking or barbecuing it. A gallon of water, a cup of sugar, a cup of salt and flavorings–you pick: onions, garlic and the magic ingredient, Liquid Smoke. That has become my standard procedure. In these later years (now officially qualifying for geezerhood) I find myself turning into a sentimental pile of mush, deeply realizing how precious time can be. You can really look at things two ways: Looking around and noticing all the things you don’t have, or realizing the endless things you already possess. I prefer the latter. Frankly, it’s a much better way to live. The Ghost of Thanksgivings Past has nothing but good things to show me and, once again, for that I am grateful. The really good news about him is that he could work 365 days a year if you’d let him, but most people choose just the one day to focus on all the things for which they could be grateful. As always, I appreciate you, the reader, for stopping by and spending a couple of moments with me. And what else could I say, but thank you. It only seems right. Well, that, and Happy Thanksgiving! Well, here comes one of my favorite holidays, Thanksgiving. Minimum decorating, no gifts to buy and its centered around eating. Bob Thanksgiving or whoever it was that invented that holiday, we thank you. Mom & Dad–How do you skip past them? Having done the great parent experiment myself, I look back and admire what they did for us. Not so much for the”things.” God knows as kids my sisters and I would complain that we never got to experience real Kellogg’s Frosted Flakes, we got the Springfield brand. Springfield soda, Springfield popcorn. It was the lesser-cost version of all the popular foods. But like I said, it wasn’t about the things, it was the environment. They gave us an abundance of guidance, stability, faith, and allowed us to be kids while growing up during those turbulent 1960s. Even when dad was out of work because of a strike or we were dangerously close to nuclear war with Cuba, my world was made up of school friends, Cub Scouts, Little League, Dodger baseball and the kids in the neighborhood. Mr. Ray and Mr. Maxwell–two of the teachers I had along the way, both with clever, dry senses of humor. I credit them for helping shape my comical thinking. Gary Owens–This Los Angeles radio legend and eventually, the announcer on “Laugh In” was nothing short of brilliant. While other kids were listening to Boss Radio KHJ (and that’s where I went after Gary was on the air) I couldn’t wait to tune in KMPC, wade through another Ray Conniff song, only to hear his witty banter and bits like The Story Lady. Blame him for me heading into a 30-year radio career. Getting Fired–Yes, it wasn’t just people, it was events. Having your career pulled out from under you either destroys you or makes you stronger. Twice, my life plans were thrown into chaos and uncertainty, but each time I emerged better off than I was before. This helped brand in my brain to keep focused on what’s really important–your life. Lose a job? You’ll be fine. Getting honorary mention is deciding to quit a job and go out on my own 3 years ago. A step I never would have taken if I hadn’t been fired. I basically fired myself, which put me into the dream situation I enjoy now. Family–My incredible wife who showed me that people can be kind and caring as a way of life. My mom & sisters, my kids and step-kids, the grandkids, the assorted nieces and nephews. Oh and all those aunts and cousins throughout the greater United States. Quite the collection of characters. Love you all! My Radio Brothers & Sisters–I made some life-long friends during that 30-year stretch of my life, most of whom I still stay in touch with today. It’s not a constant-contact kind of thing, but put us together anywhere and we can pick up right where we last left off. My Memories–In the amusement park that is my mind, there’s a wonderful place called Yesterday. It’s where I go and reflect on my dad, my radio mentor Larry Nelson and my former morning show co-host Alice Porter. One of my high school classmates Dr. Jon Lemler is there, too. The class of ’73 will remember him playing “Suwanne River” with his hands at the senior talent show. I’ll be forever grateful to him for talking with my wife at one of our reunions where she told him about her kidney disease. Jon helped us with some alternative medicine that we are convinced helped Victoria’s disease go into remission. A couple of years ago, Jon was walking in Las Vegas when he collapsed and died from a massive heart attack. You see, I’ve had the incredible fortune of meeting some amazing people along the way. Star Boreson–I had incredible timing and, even though I didn’t grow up with him here in Seattle, during my days at KOMO, he came in as the revered former TV show host and I got to know him. Enough that he invited me over to his and Barbara’s house for a couple of afternoons, where we wrote parody songs for his next Christmas album. Read the fine print on the cover, there I am. Buried in our basement are the original hand-written lyrics to a lot of those songs on the album. It was a college-level course on how to create a comedy, which I used many, many times throughout my career. And still do, to this day. Matt Riedy & Frank King–It’s all about opportunity. Back when radio brother-turned-actor Matt was working over at Smooth Jazz, he connected me to a comedian he had worked with, Frank King. Frank used to do stand-up comedy with Jay Leno and had remained connected to him, faxing him jokes each day. Frank invited me to join his White Collar Comedy submission sheet and for most of a decade, I was lucky enough to be able to sell jokes to Jay. The thrill of having him tell a joke that I wrote, word for word, was about the biggest high a comedy writer could experience. Dwight Perry–This Seattle Times’ lighter side of sports writer has dropped in some of my Wacky Week lines over the years and given me exposure that I wouldn’t otherwise receive, being off the air. As recently as last Sunday, a friend said, “Hey, I saw you in the sports page again today!” Thanks for the plugs, Dwight! Jean Godden & Sherry Grindeland–When both were back in their day writing newspaper columns, they gave me quite a few mentions and let me show off my comedy writing skills to their readership. You–A writer is nothing without readers. If no one bothers reading it, then I would be just entertaining myself. (which I do anyway. I’m a great audience) I’ve managed to write over 800 blogs these past 15 years, with 42,543 views the last time I checked. I am humbled. I’m just a guy going along for the ride who believes everyone should be doing what they love to do. It truly makes all the difference in the world. I wish you peace, hope and happiness as we gather again to give thanks for all we’ve got. It’s a shame we really only do this once a year. If nothing else, the holiday serves as that annual reminder that we truly are blessed. Seriously, you’ve heard ’em all before. But I do have to say, in spite of our really busy personal schedules with work tossed in, I think I’m doing a decent job of actually enjoying the holiday season. I do have over-achieving as a goal, but somehow each year I pull it off and it’s just about time to fire up the engines again. The N.A.C.C. Julebord–I began attending this when I married Victoria, the uber-Norwegian. It’s an annual lunchtime gala at the Seattle Golf Club that is decadent and extremely fun. Within a couple of years, the elderly emcee had to give up the microphone and I was called into service. I think this is my 6th Julebord (pronounced YULE-uh-BOARD). It’s actually a pretty cushy gig and let’s me get being a goofball out of my system. I do a brief monologue at the beginning which evolves into me doing a parody song about something. Then it’s just keeping the event moving along, with songs, door prizes and a tad bit of drinking. SANTA CLAUS ARRIVAL AT BOTHELL’S COUNTRY VILLAGE SHOPPING CENTER–I believe I’m in my 14th year (at least) of hosting this event. My evening duties begin at 6pm when I stroll the village dressed up like a town crier, “Hear ye! Hear ye!” bell and all, announcing that Santa Claus arrives at 7pm. Back when I started, Santa’s sleigh actually flew in on a wire, but eventually, the liability became too much. I’ll never forget the year that someone parked right in the flight path and I led the crowd in a “Tow that car!” chant until they eventually did. Longest 25 minutes of my life. The event means even more to me because we’re down to the final two Christmas’s where I’ll be doing this. The village has been sold and after the 2018 Santa arrival, the place will become history. THE NORWEGIAN LADIES CHORUS OF SEATTLE HOLIDAY CONCERT–What I love most about this is I just have to show up. I usually go up in the rafters and videotape the concert and, much like country village, this could be a limited-time tradition. Our Redeemer’s Lutheran Church in Ballard–where we were married–is going to be undergoing a massive renovation in the near future, which includes taking down the choir loft. MY ANNUAL CHRISTMAS CD–The days of it actually being a CD are limited as well. In fact, only a select few will be burned this year, as the world moves towards digital music. This will be my 17th edition of “HO HO BROTHER”, which features fun, festive and funny Christmas songs, along with some original comedy bits from either my radio past, or new ones. If you’d be interested in getting this year’s collection, just let me know and I’ll put you on the naughty list. MY ANNUAL CHRISTMAS MUSIC VIDEO–This is probably the most ambitious thing I do and I need to get going on it. I hooked up with a young singer named Alana Baxter some years ago and we have done a series of silly Christmas songs, complete with video. Now, since she has relocated to Hawaii, it’s made the task even more challenging. So what we did last year was to record this year’s song. I’ve got her voice track. I’ll just have to round up some video and be creative and then we’ll have another one to add to the collection. Her song is also usually included with my Christmas CD collection. If you’d like to enjoy some of our previous works, here you go! Add to all that the holiday shopping, the annual parties, a Bothell Wine Walk, watching some favorite Christmas movies, getting out the Christmas cards (we’re STILL doing that) and everything else that crops up and yes, we are heading into one, busy, festive season. But as I said, there will come a time when I’ll be reflecting back on these days and all of this will be nothing more than my ghosts of Christmas past. So, I’m just going to enjoy the heck out of them while it’s all a part of my present. Once again, we’ve reached Thanksgiving Day. As a kid, Christmas was by far the biggest holiday of the year. Easter would have been second, but it lost out to Halloween because even though both involve lots of candy, you had to get dressed up and go to church on Easter. Oh, the Easter Bunny tried to compensate for that by bribing us with chocolate replicas of himself. But with Halloween, you dressed up in a fun costume and then just went out to strangers’ houses and collected candy. Is this a great country or what? But, the years roll by and the next thing you know, holidays start coming around faster and faster. That’s why, in my book, Thanksgiving has risen to the number one spot. As hard as Christmas tries to overshadow it, Turkey Day remains a no-gift holiday, where you simply gather with friends or family or both and eat way too much. And there’s football on TV, from 9am to 9pm. It’s like I won the lotto! And even if my wife manages to sweet-talk our crowd into turning off football and watching the first Christmas movie of the season that day, I’m in! I have a collection of 15 or so movies that I must see every year, or it’s not Christmas. Thanksgiving weekend can start with “Miracle on 34th Street” (since it begins with the Thanksgiving Macy’s Day parade), I never get tired of “Plains, Trains and Automobiles”, and then maybe a “Home Alone” or two. Then I’ve got three weeks to wedge in “It’s a Wonderful Life”, the Alastair Sim version of “A Christmas Carol”, “One Magic Christmas” and all the other holiday standards. It’s just a great time of year. The Christmas season officially kicks off big-time the first weekend of December, but I’ll get into that with you next week. For now and the next 36 hours or so, it’s Thanksgiving. Being thankful is trickier than it should be. When you go online and start rambling about all the things you’re thankful for, there’s a chance someone is reading it that isn’t having a great year. Maybe they lost someone close to them. And here you are, talking about how much you have to be grateful for–how dare you! Then, if you don’t say anything, there are those who consider you ungrateful. “What’s wrong with him? Had a bad year?” You can’t win. Thanksgiving began unofficially when people escaping religious persecution risked their lives to travel to a new land. When you go through something traumatic like that, not knowing if you’re going to live or die or what’s on the other side, you tend to get grounded and be appreciative of the basics. President Lincoln had to deal with a country torn apart. No doubt it was a big part of his push for a national day of Thanksgiving. Now, here we are in 2015, getting ready to show our thanks in a world gone mad (while the truth is, it’s always been mad. It just comes and goes.) We have real problems, like what’s going on in Turkey with Russia, ISIS and such. And then, there are the manufactured problems. As I watch hyper-sensitive revisionists declaring war on things because of their victim mentality, I just shake my head and wonder just how far this PC insanity will go. In case you didn’t hear, students up at Western Washington University want to get rid of the Viking as their school mascot because he “represents violence”, while students back at Princeton have decided that President Wilson was a racist and so his name should be completely removed from the school. I maintain a pretty crazy, on-the-go schedule, but I do keep reminding myself to just take a look around and appreciate all that I have. Not things, but situations. My marriage, my kids, I have a roof over my head–yeah, I know, there he goes bragging again–but this year, especially, I’m grateful to be able to do what I want to do for a living. For most of my career, I’ve been in that situation, but with someone occasionally sticking their nose in and telling me how to do it. Now, I wake up every day, look at a list of projects, tackle the ones I think are the most pressing, watch some TV, go to bed and start all over the next day. Just a moment ago, while writing this blog, my ventriloquist buddy Mark Merchant called me from Cabo. He wanted to make sure I got the notes on three upcoming gigs he has. After this, I’ll sit down, look at the notes and start writing jokes. Yeah, I get to do that. A year ago, I rolled the dice and quit a job, hoping it would all work out. It has. I’m grateful for everyone’s support, for the clients that hired me and for every single person I stay in touch with. If you hear from me during the year via Facebook, email, a phone call or we manage to actually pull off a coffee or lunch, it happens because you are among those I care about. I appreciate your friendship and right now, would just like to say thanks for being a part of my personal E-ticket ride on this earth. It’s the day before we’re supposed to officially be grateful for all we’ve got, but I thought I’d get a head start. I tend to over think things and so, the first place I go is that “if you talk about all the good things in your life, you’ll make someone having a tough time right now feel worse.” That is not my intent. Intention has to count for something, right? This collection of words is about gratitude. As we approach a season dripping with “What can I get?”, I’ve already got plenty and I just want to acknowledge it. I have to start with the fact that my wife and I are in good health and our kids are all doing just fine. Life will never be perfect, but each challenge is an opportunity to grow and help better equip you for the next bump that comes along. They happen. As recently as yesterday, I found out that we’ll have all the kids with us at Thanksgiving brunch. We might actually be able to get in a group picture and as you get up in there in years, you know how challenging that can be to have everyone in the same spot at the same time. This year, Photoshop gets the year off. I’m waking up every day and doing exactly what I want to do and that’s among the greatest blessings anyone can ask for. In the almost two months of Tim Hunter Creative Services, I’ve had a steady stream of meetings and projects that pay the bills. You just can’t ask for much more than that. I find it ironic that a day originally designed to be free of gifts, commercialism and want has been invaded by stores being open and sales that intend to make you want more than what you’ve got. You can shop any time. In this day and age, wake up at 2am, think “I need that”, go to the computer and order it and it’s there two days later. Do everything you can to keep Thanksgiving a day of reflection, football, roasting turkey or tofurkey in the oven and just talking with family who won’t always be there. These are the times we’ll remember in the years ahead. I’ve been around long enough to realize that “the good old days” are actually right now. Over time, our selective memories filter out the blemishes and we’ll recall that year back in 2014 when we started making sure that every Thanksgiving Day counted. When we remembered all that we have instead of all that we need or want. The happiest of Thanksgiving to you and your kin.